If you’re like me, you harvested a lot of vegetables this Fall. Gardening in the Yukon is amazing! With long hours of sunlight, a crop of vegetables can be yours in 10 weeks. But then you have a huge harvest. You can’t possibly eat them all in a few weeks. Outside of freezing, how do you store vegetables? Can someone store vegetables all winter and keep them as fresh as if they were still in the ground? Well, I know a way. Bruce Pedersen, local chiropractor, has been using a method that keeps tons of vegetables from his garden fresh all winter long. 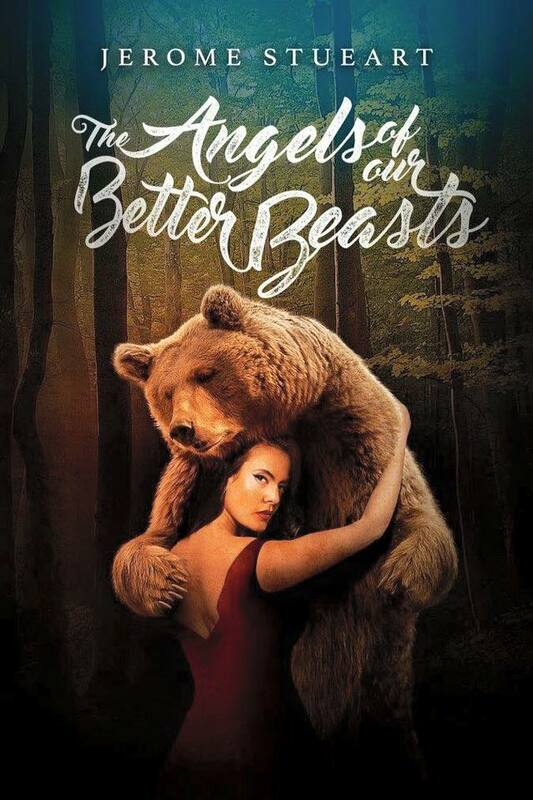 Try his method and see if it works for you. 1. 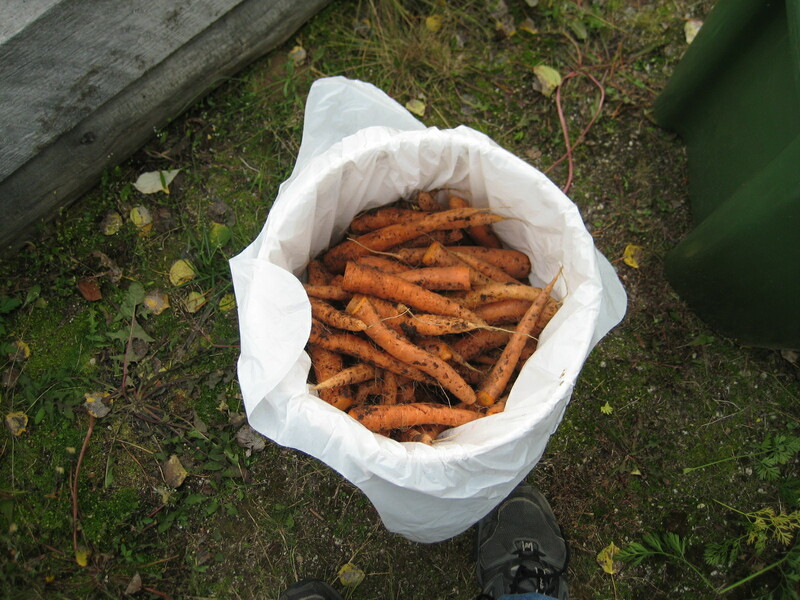 For carrots, beets, turnips: get a large paint bucket and place an ordinary kitchen trash bag inside the bucket as a liner. Don’t use the drawstring, get the ones with those flaps you have to tie with. 2. Pull up your vegetables from the ground. Don’t wash them. 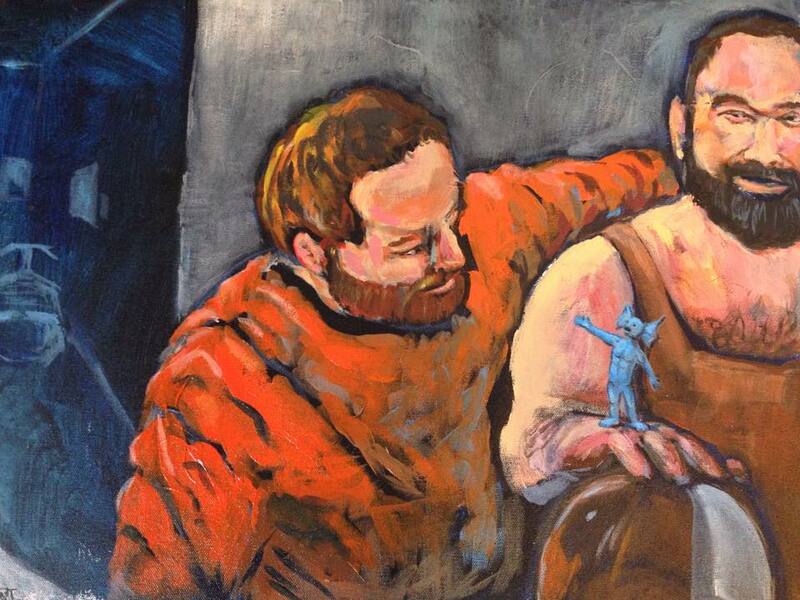 Just shake the dirt off. Don’t wipe or try to clean them. “When people scrub a vegetable clean, they damage the skin and then they have to eat it right away or it will rot faster,” Dr. Pedersen says. So, don’t clean these. 3. Right at the truck, he had a cutting board and a knife. Take the knife and cut off the greens, slicing just at the top of the carrot, or beet. 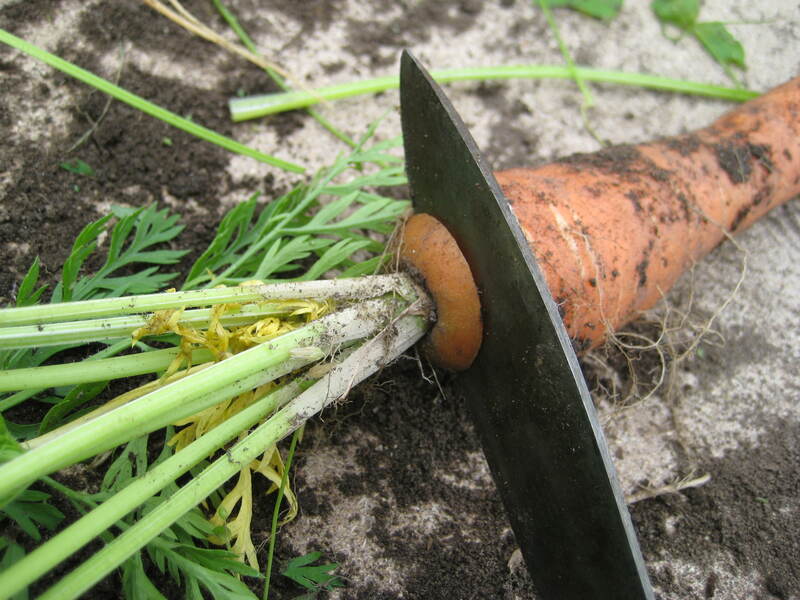 For carrots and beets, you only make one cut–to take off the greens. With beets, you leave on the long root if it has one. For turnips, you’re going to make two cuts: one to clear off the greens, and the second to cut off the roots, so it’s a round ball. 4. These headless carrots all go in the trash-bag lined bucket, all on top of each other. Don’t worry if you get dirt in there. Be careful putting them in the bucket. If they’re long and break off on impact, then you have to dispose of them (eat them right there!) They’ll rot if they go in the bucket broken. This bucket actually needs more carrots in it first. 5. Fill the bucket till it’s 3/4 full or 4/5. 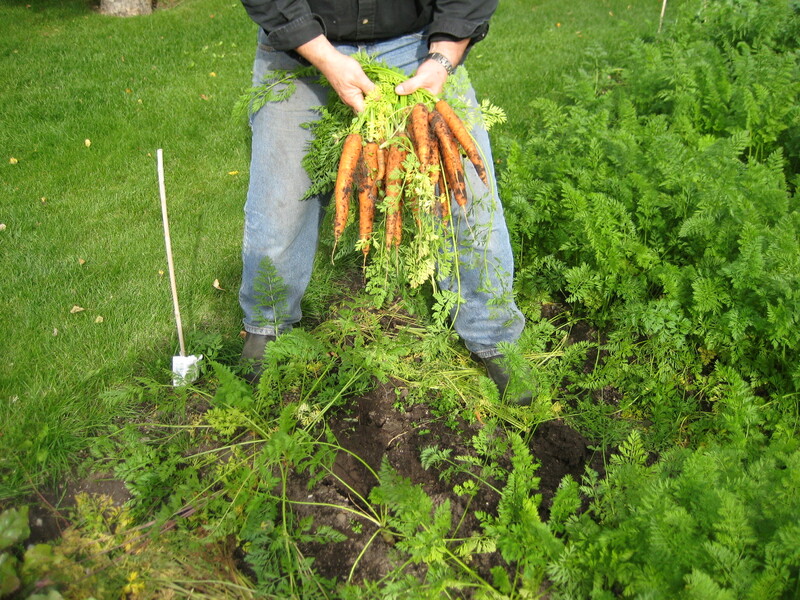 Then shake the bucket a bit to settle the carrots. 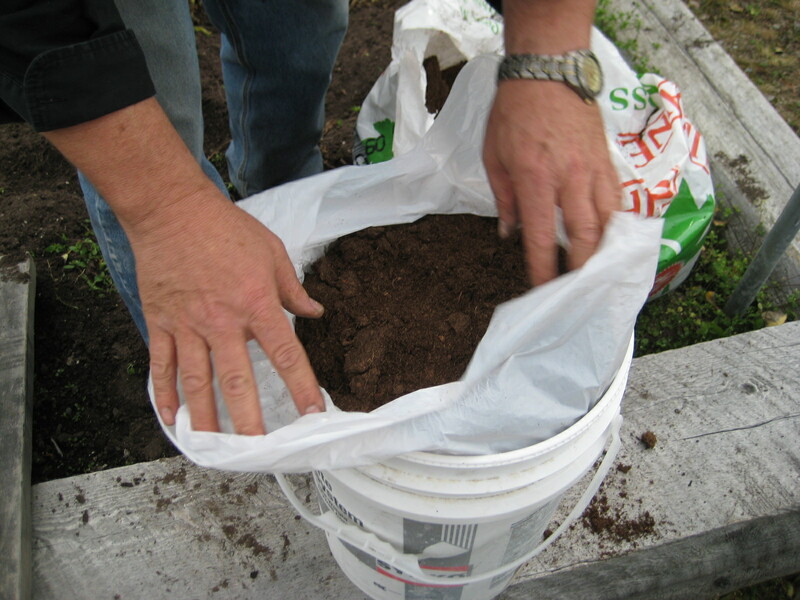 Then take ordinary peat moss and fill the bucket with peat moss till it is full. 6. Then take the trashbag flaps and nearly cover the peat moss, leaving a hole showing the peat that’s about the size of a tennis ball. “This is to help the peat moss breathe. You don’t want it all completely covered–but you don’t want more than a small hole either.” You’ll tape down the bag in place. 7. Store the buckets of vegetables in your garage over the winter, or a cool, dry place. Not a freezing place. And not in your house where it will be too warm. Maybe an entryway, or a back porch. 8. 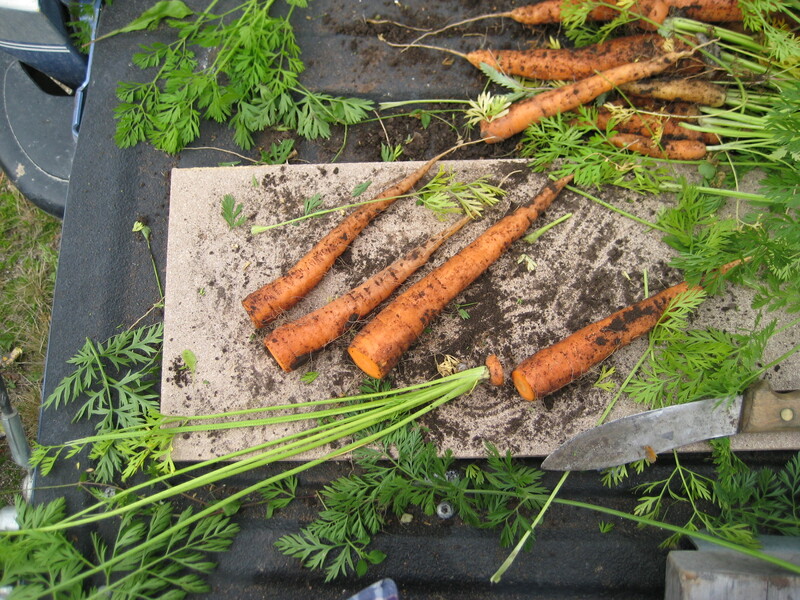 Over the winter, just dig out your carrots, beets, turnips, etc. from the buckets when you need them. 9. For potatoes, put the bunch of potatoes in a large styrofoam cooler, the kind you get at Canadian Tire. Fill that with peat moss too. Cover with a trashbag, stretched out over the top, taped down in places, but with enough space in other places to let the peat moss breathe. And just dig up a potato when you need it. Why peat moss? Peat is a moisture regulator. It seems to draw in the extra moisture from the newly harvested vegetables and then gives it back to the vegetables when they get dry. It seems also to slow the decay of the vegetables, almost holding them in a stasis for a longer period of time. Sand doesn’t regulate moisture and is a lot messier to work with. Also you need more sand to cover the vegetables because it will sink down to the bottom. The peat mostly rests on top as a barrier to the cold dry air. 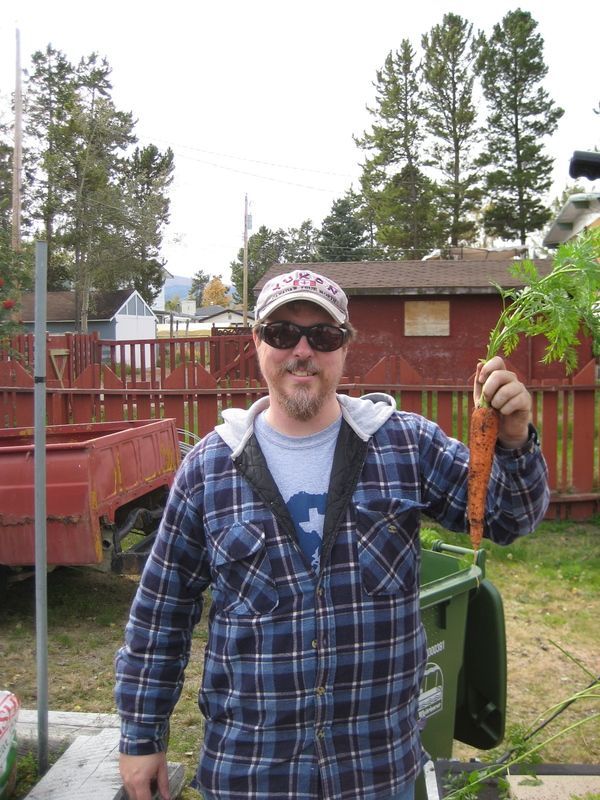 Bruce Pedersen has done this for several years and has had fresh vegetables all winter long. Hopefully, the method will work for you too. If you found this information helpful, please consider donating just .99 cents. It keeps us writers fed. One of his regular-size carrots!